For the 4th year, myself and co-founder, Mia Wenjen, are gearing up for yet another wildly successful Multicultural Children’s Book Day on January 27, 2017! SO MUCH is in the works this year and we are giddy with excitement (and dying to spill the beans), but we can’t share just yet. One major change to the MCCBD process we CAN share and it involves all of the book lovers and reviewers out there that, year after year, step forward to review multicultural children’s books in honor of this online holiday. 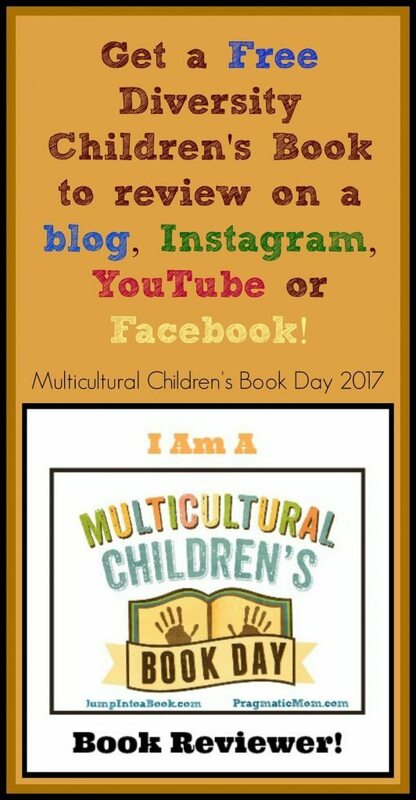 So let me ask you; are you interested in receiving a FREE multicultural children’s book to review for Multicultural Children’s Book Day 2017? The MCCBD team has a new perk this year that will appeal to more than bloggers! In years past, MCCBD has asked for BLOGGERS to sign up to receive a free book in return for a review on their blog in honor of the January 27th online event. This year, they are thrilled to expand their invitation for a FREE diversity book to review, along with the optional book extension activity to blog posts, to anyone who is active on social media platforms like Instagram, Facebook and YouTube. In a nutshell; you don’t have to be a blogger to review multicultural children’s books for the MCCBD 2017 holiday! You just need to have a love of diversity in children’s literature and be willing to share on your social media platforms such as Facebook, Instagram or YouTube. Just pick the social media platform that you are most comfortable on and post your review for everyone to read and enjoy there. When signing up to be one of our book reviewers simply indicate which platform(s) you plan to post your review on in the “blog URL” space on the below Google sign up form that can be found HERE. Step One:Reviewers sign up via a Google Sign-up and review a multicultural children’s book for this event. If you will be posting your book review somewhere other than a blog, simply indicate which platform(s) you plan to post your review on in the “blog URL” space on the below Google sign up form. Step Two: Reviewers are then “matched” by the MCCBD team with an author or publisher that will supply them with a free children’s book to review some time in November/December. Step Three: Once matched, an email will go out sharing who you are matched with. Please respond in a timely fashion with the best mailing address to mail your free children’s book to. Authors and Publishers are responsible for getting reviewers their books so we want to give everyone plenty of time to receive and read their free book. Step Four: Reviewers are then encouraged to share their thoughts on the book (a basic book review) in the form of a complete and descriptive post on their chosen platform Many Reviewers add a book extension activity that is fun and acts as a way to bring the story to life. Step Five: Once the book review post is live (any time between January 1 and January 27th is good), Reviewers are invited to “link up” their blog post on the Linky that will be found on any of their CoHosts’ sites and also the MCCBD website. This linky will go live on January 27th..
School is back in session in many parts of the world and our youngsters are settling into a new routine of learning and structured reading. With the hectic days of summer behind us, the habit of daily reading is back at the top of most parent’s priority lists. Reading is always an important part of our children’s lives no matter what time of year it is so I decided to wrap my knowledge of fun kidlit books and activities up with my experience as one of the co-founders of the very successful Multicultural Children’s Book Day and create a unique resource for parents who are looking for creative ways to keep their kids reading all year long. Reading is important, but so is helping our young readers learn about other cultures, religions and traditions through the pages of these books. Here are some great booklists and resources that I have created over the years at Jump Into a Book that will not only give parents and readers great ideas on diverse kids’ books, but fun activities related to books that will bring stories to life! Sign up below for quick and free access to 180 Multicultural Book Ideas: World Travel through Kidlit Reading! Next Post Weekend Links-Prepping for Halloween Fun!